Gabe Hogan is known around campus for being insanely fast. 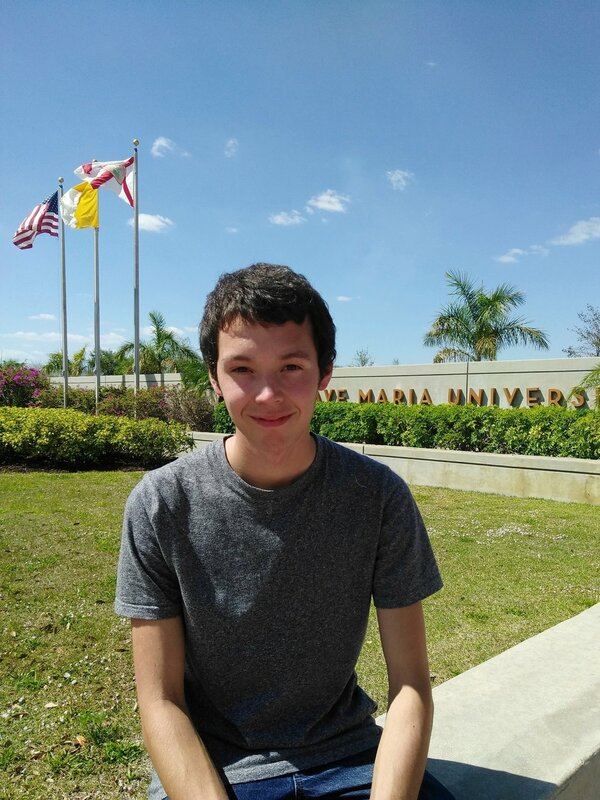 The freshman cross-country runner from Oxford, Michigan appreciates all of the beautiful diversity that Florida has to offer and is really enjoying his first year at Ave. Gabe is currently discerning which major he will pursue, and leaning toward a field in the health sciences. He is captivatingly funny, always in high spirits, and a joy to be around. I love to play soccer, ultimate frisbee, and I love to run…basically anything that involves being outside. I don't belong in a chair. I tried out for soccer my freshman year of high school just for fun because I really enjoyed the sport. We did a timed two mile run as part of try-outs and I did it in under eleven minutes. My coach looked at me and said, “You’re in the wrong sport right now.” I tried out for cross country shortly after and fell in love. Distance is my thing, not sprints. The fastest mile I ever ran took me four minutes and thirty seconds. My best 5k time is 15:52. I don’t feel like I’m all that fast, but the more I think about, it the crazier it is to me. I pick a pace and I don’t really slow down, that’s my strategy. I just tried running an 8k this year and definitely met my match. It’s a new beast and I have yet to figure out the distance and how to pace it accordingly. Running is applied to every aspect of my life in a ridiculous way…I’m sort of a running nerd. If I’m not running, I’m using running as an analogy. Running allows me to focus and push myself to be the best version of me. Is there a big difference training for cross-country in Florida vs. in Michigan? In the beginning the difference was very noticeable. The first few weeks were really tough and I did have to adjust, but that mostly just meant running earlier in the day than I was used to. Here I almost exclusively run when the sun either has set or hasn't risen yet, that way I avoid the worst of the humidity. In that aspect I've lost sleep for the sake of running. One of the hidden perks of Florida is the lack of hills though! I would say Michigan offers more flexibility, but Florida in general is a bit easier to run in... especially because I can run year round! As someone who is a Freshman and undeclared, where do you see yourself after graduation? I like science and I like the idea of helping people. I’m leaning towards exercise science, but nursing sounds really appealing as well. I was helped by a bunch of physical therapists in high school because I was injured a few times. My achilles tendon is actually my achilles heel. My PT’s helped me with that and I was super impressed by how much they knew about the body. I liked the techniques they gave me to train more efficiently and I could definitely picture myself doing that. I also have interest in being a nurse. I see hospitals as a pretty foreboding place right now with a lot people that are sad. I like to make people smile as much as I can, so if I could go in there and make someone laugh while doing my job, it might be a form of medication. What are your three favorite places in the world? I like to wander because it helps me realize how great my home is. My three favorite places in the world are Canada, Spain, and Michigan. In Canada, there is this place called Prince Edward Island. We have extended family up there on my mom’s side and in the summer, we go up to this house that is right on the ocean. Our favorite thing is the water trampoline they have that is 400 meters off-shore. Being there with our cousins is just such great, innocent fun. We have a lobster fest, skip rocks for hours, make bonfires, and look at the stars. My second favorite place would have to be Spain. It is very, very beautiful. I didn’t really get to see the touristy part of it because I walked the Camino with some guys from my diocese back home. I think we did about 180 miles in total. We were very much in the back country, so we really got a feel for normal life in Spain, rather than the hustle of the city. Michigan is my most favorite. My family and I live in the middle of nowhere on 10 acres and I love having our own little area. It has been an amazing place to grow up just because of all of the freedom. I also love the Sleeping Bear sand dunes up in Leelanau and the town of Petoskey. You know how I said earlier that I use running as an analogy for a lot of things? One of the things I love about running is that there is a very obvious goal in place. If you don't run as fast as you did before, the clock is going to show it. It won’t lie to you. Instead, it will make you want to step up your game! I like the idea of brutal truth keeping me accountable. I try to be as honest with myself as I can and to evaluate what I’m doing right and what I’m doing wrong. I am very self motivated but there are definitely people that I look up to, and I think to myself, “They didn’t take off days, so neither should I.” I’m always looking to be a better me. I do not, but I know I need to make one! Thinking about going back home and working this summer, I know that I should have one ready in case a future employer wants to see it. What do you plan on doing this summer? I would really like to get into a facility called Health Quest near me, which is a physical therapy office. I don’t think I’ll get paid, it would just be more of an internship/shadowing job because I haven’t really taken any pre-health classes that are specific to the health field. I have a couple of jobs at home that I could go back to in the restaurant business. I'm hoping not to, but they seem to be the most convenient at present. Probably just the amount of craziness that comes with the college year. I guess the funniest thing is just looking back on what I thought college was going to be like. For example, I was at a friend’s house in town and we made pizza rolls. I had a meeting back on campus, so I didn’t have enough time to eat them before the meeting. I borrowed a scooter and rode as fast as I could back to campus holding a plate of pizza rolls. I thought I was going to be put-together and official when I was in college, but there I was, scootering down Ave Blvd. with pizza rolls in hand. Tell me about the Debate Team! At the end of last semester, Ambrose, Augustine, and JP approached me and said that they needed a judge for their debate meeting. At that time, August was the only one with any formal training. Strangely, I actually ended up speaking at that meeting because one of the team members couldn’t make it. They asked me a few weeks later to formally join their team, and the first thing we did after I joined was go to Colorado to compete! We went in as total underdogs and got destroyed first round, but by the third round, we were holding our own and really competing. It was impressive because we have no formal training whatsoever. Some of the students there were crazy good speakers. You’re on a timetable when you’re speaking, so if you are fast, that’s a big factor. If you can be persuasive, fast, and coherent, though, you're deadly. The biggest shock was at the end of the competition. The judges scored each individual teammate and announced the top three individual speakers of the whole competition. I remember sitting in the audience listening to the judges announce the third and second place winners, and I was just thinking, “Who could be number one? Those two were the best! I can’t think of a better person!”, but there were a few teams I hadn’t gone up against, so I just figured it was one of them. All of a sudden, my team mates were all looking at me and yelling “GO! IT’S YOU!”, and I was so confused. I did not have any clue what was happening. They said the look on my face was priceless when I realized I had won. I still don’t really believe it, but it was a really nice surprise! What do you look forward to in your college career? What do you hope to accomplish? *Laughing* First and foremost, I’d like to pick a degree. After that, I would like to feel very confident in my studies and be able to have fun studying for the career path that I choose. However, I also don’t want to miss the little things. I am so excited to be down here. It’s not a vacation, don't get me wrong, but there are definitely things I want to see or try before I leave Florida. I want to see the Keys, go on a fan boat ride, and explore the Everglades. I didn’t think I’d be joining a debate club and having such a fun year in general. I’m excited for the surprises and the academic success which I’m hoping will continue to come. I want to rise to the occasion and have fun while doing it. Who is your favorite Professor? Dr. Dittus. Math is not my thing at all, and every time I’m sitting in class thinking, “When would I use this?”, he talks about its' application it to real life and gives specific examples as to when you could use what we are studying. He has just always made math a lot more fun. I also really like Mrs. Blanchard. She’s an awesome teacher. I love her sarcasm because it makes class so entertaining. If you’re falling asleep, you’re going to miss comments that may or may not be aimed at you.